Did aliens in Fallout start the Great War? This phenomenon reached a heyday in the early days of the atomic age, when man's technology advanced at a pace not seen before in history. Lasers, fission power, flying aircraft, and even microwave ovens have been “explained” by conspiracy theorists as the result of a government cover-up of alien technology (Area 51?). As man's understanding of science grew, so did man's superstition of it. Stories of alien contact and, occasionally, abductions, became increasingly common and fanciful. These tales were especially common in rural communities, where the less well-educated sought attention in a world evolving faster than they were comfortable with. Even today, some even think the Great War was the result of either an accident involving alien technology, or actual alien interference in human affairs. As it happens, the conspiracists were both right and wrong. Aliens have, in fact, been observing humans for hundreds, possibly thousands of years. Many of the stories of mysterious kidnappings, disappearances, and horrifying experimentation are, in fact, true. Not all, of course - but enough are to give an air of plausibility to those that tell them. Throughout the ruins of North America, wasteland explorers have claimed to have stumbled across crashed alien spacecraft and found remnants of fantastic technology contained within. Some of the weapons technology developed and used by the Enclave and Brotherhood of Steel is rumored to have been developed based on such trinkets. Capital Wasteland legend has it that one former vault dweller, known locally as the Lone Wanderer, stumbled across a crash site and was actually taken aboard the aliens' spacecraft. There, the Lone Wanderer found a team of other abductees, including an American soldier from the Resource Wars, a 19th century gunslinger, and a samurai from feudal Japan. With this ragtag team this unlikely hero took over the craft and repelled a greater invasion by the aliens, saving the remnants of human society in the process. The Wanderer's diaries described the aliens as smaller than the average human, physically slender with spindly arms, legs and fingers, and with bulbous heads, green or green skin and large, unblinking black eyes. No specimens were brought back for further study, however. The only alien found on Earth was quickly consumed by wasteland creatures, leaving only a few scraps of bone and fragments of tech. Rumors of any extraterrestrial involvement in the Great War are most likely false and represent wishful thinking on the part of people who understimate man's innate capacity for self-destruction. And that's all we've got on Fallout Aliens. Aliens causing the Great War? Unlikely. The Mothership Zeta add-on is not canon. Anyway, that's it for today, wastelanders! 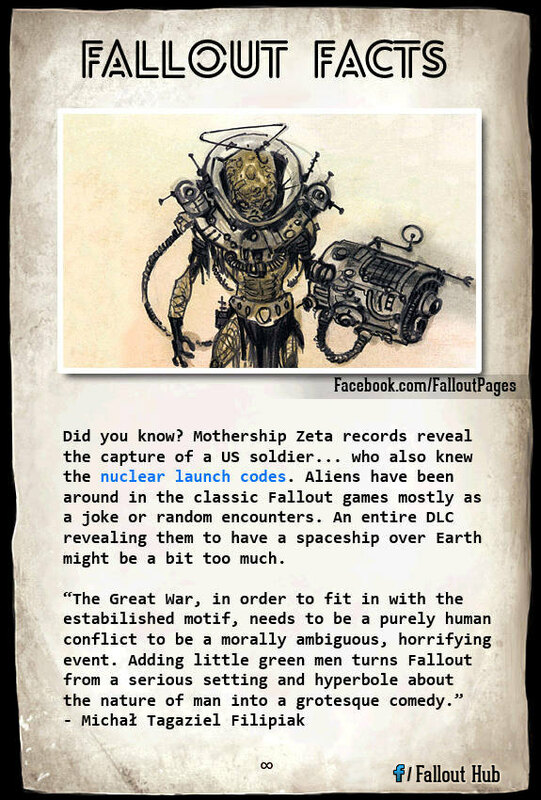 Stay tuned for more Fallout Facts coming up soon.